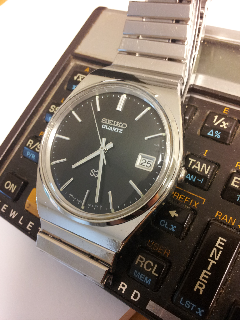 Got this Seiko from a colleague at work. He was planning to give his old graduation watch to his son and was wondering if I could fix it up a bit. So I did. Just a case of some TLC. The Seiko is from 1980 and the case and crystal had some scratches that I removed with Autosol and a Dremmel the end result came out pretty good just after an hours work. Love it. I wear one every day and only paid $20 for it a year or so ago.